According to Indian Orthopedic Association, the number of accidents per thousand vehicles in India is as high as 35, while the figures range around 5 in developed countries. The report added that there is one death on Indian roads every six minutes and this figure is predicted to escalate to one death every three minutes by 2020 if enough initiatives are not undertaken. Along with the lines of India’s governmental and non-governmental projects to curb accidents, Kerala based Elsys Intelligent Devices plays an important role by offering ‘Raksha SafeDrive’,a connected car device dedicated for Road Emergency Management. SafeDrive is an independent crash sensing device and is vehicle manufacturer agnostic. It fits into most vehicles and is easy to install.Raksha is the backend cloud infrastructure that communicates with all SafeDrive sensor units and provides accident notifications to first responders. The Raksha platform also provides major data analytics and doubles as their service delivery platform. With core expertise in Product Development Engineering, this Thiruvananthapuram based firm’s product- ‘Raksha SafeDrive’ provides expeditious automatic crash notifications instantly to pre-programmed emergency contacts of the accident victim. Raksha SafeDrive works by employing advances in Internet of Things and Mobile Technologies. “Like an airbag sensor Raksha SafeDrive with no user intervention detects if the vehicle gets involved in an accident and then automatically transmits distress messages including GPS location information to our servers and accordingly distress and call for help messages are sent to customer’s emergency contacts as well as emergency responders including 108 services in real time.” explains Prasad Pillai, Co-Founder & CEO. Mr. Pillai is an engineering Professional with over 15 years of experience in Product Research and Development, founded the company in 2010 with a vision to minimize road accidental deaths in India by making ‘SafeDrive’ a major safety component of every car in the future. Once ‘Raksha SafeDrive’ is mounted into the vehicle,using its inbuilt impact sensors, the system detects accidents and collects high accuracy location information from onboard GPS. Then this information is processed and transmitted by the SafeDrive device via cellular technologies. “The other products currently available in the market are limited to providing location-tracking features. SafeDrive adds a new spin by adding an in-built crash sensing and notification mechanism,” adds Prasad. Raksha SafeDrive also has a one touch panic button which enables users to call for help by pressing the panic button and be connected to the emergency helpline and speak to a live agent who can assist in an event of an emergency. IoT has apparently become a potential game changer in automobile industry and Raksha SafeDrive intends to participate by focusing on addressing the safety and security aspects of road travel and improving user experience. 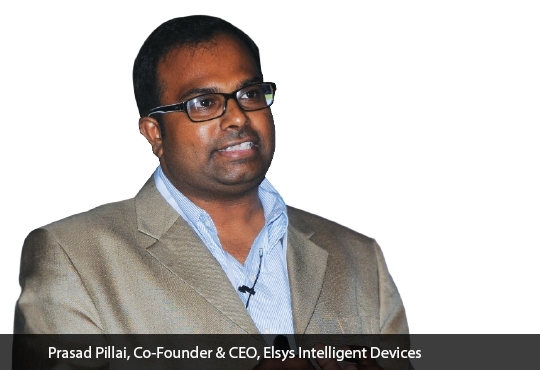 Elsys Intelligent Devices plans to add more features to address pre-accident safety and also provide mobile app based driver behavior monitoring for Raksha SafeDrive customers in the near future. “Our vision is to usher in a new era of automotive and road transport safety in India. We hope to bring SafeDrive technology to the masses and make a meaningful impact in tackling road safety issues in India” The Co-Founder CEO of the Elsys,Mr. Prasad said in response to our questions on future plans.